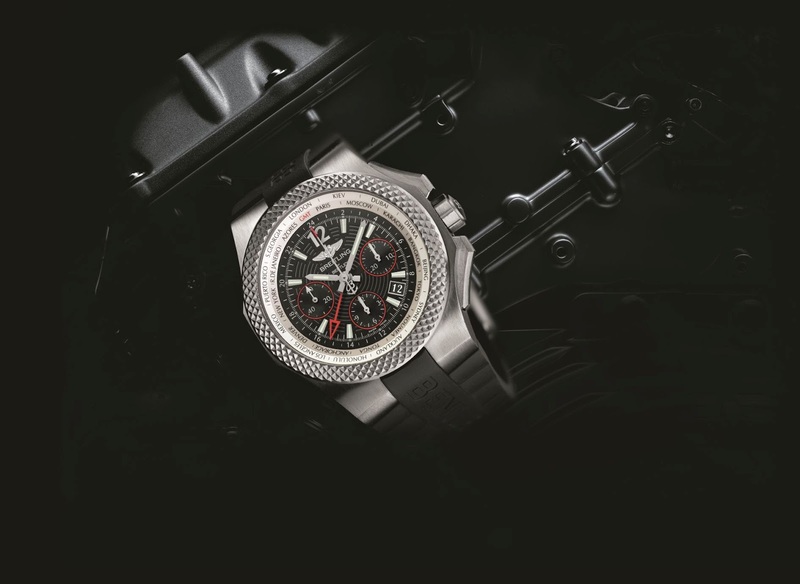 The Bentley GMT Light Body B04 chronograph welcomes two new interpretations of its extremely original design: one in black titanium, and the other in a more compact diameter. 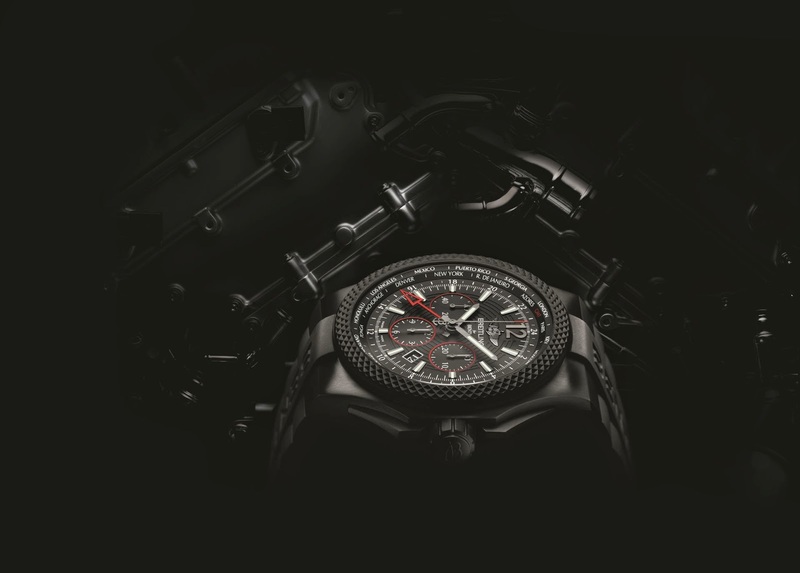 Beneath the taut, sporty bodywork beats a Manufacture Breitling movement with an incomparably user-friendly second time zone display. Equipped with an ultra-light titanium case, the Bentley GMT Light Body B04 combines the quintessence of British chic with exceptional ‘motorization’. 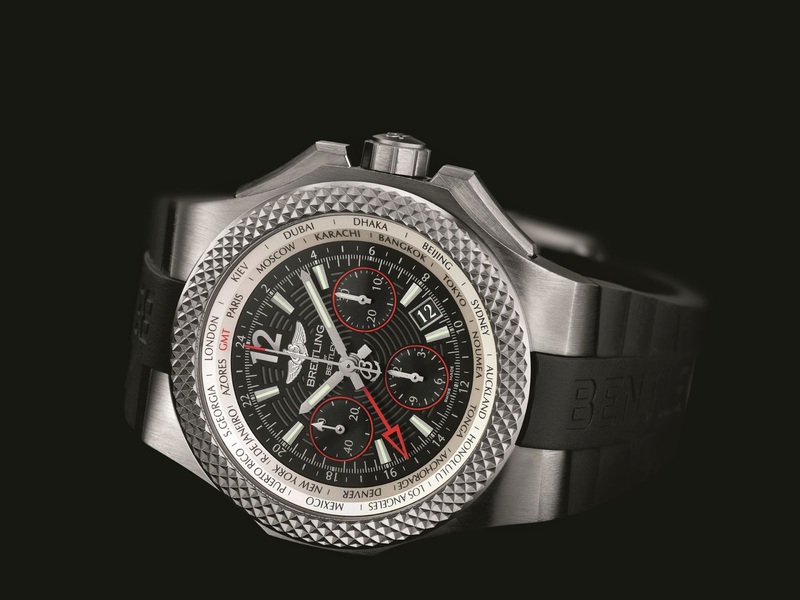 It is distinguished by its daring design featuring asymmetrical lugs, a black rubber strap, ergonomic push-pieces and a bezel with a knurled motif inspired by the Bentley radiator grilles. This keen traveller now takes to the road in two new versions: the Bentley GMT Light Body B04 Midnight Carbon, featuring a case with a highly resistant black carbon-based coating; and the Bentley GMT Light Body B04 S, with a ‘natural’ titanium 45 mm case and black or silver dial. These mechanical timepieces are distinguished by their unprecedented user friendliness. To adjust the main hour hand to local time, the user simply pulls out the crown and turns it in either direction in one-hour increments – a manoeuvre that also automatically corrects the date both backwards and forwards. 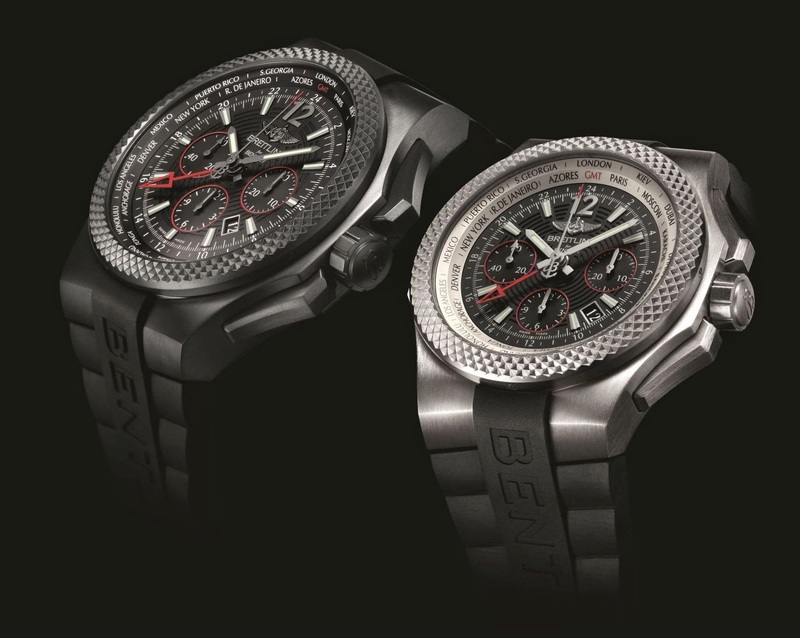 This feat is driven by Manufacture Breitling Calibre B04, which has been rewarded by two patents. 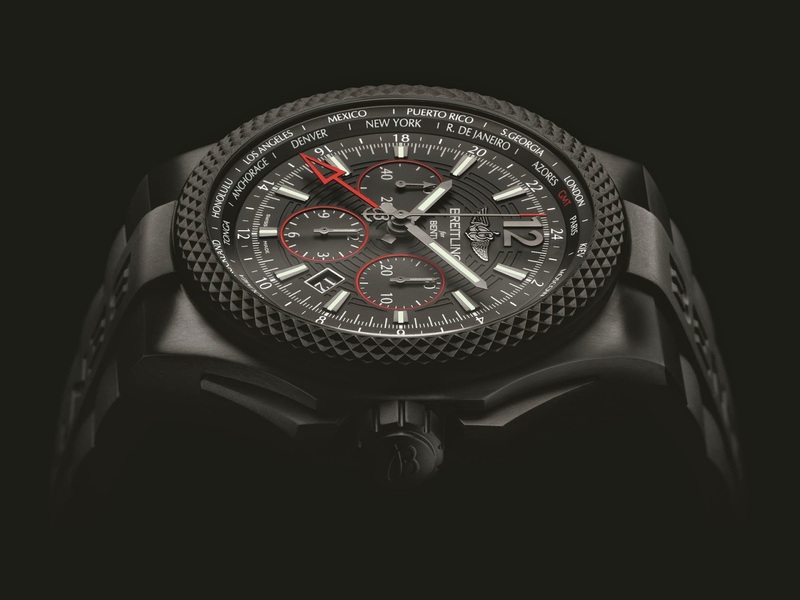 As an additional practical travel feature, the rotating inner bezel bearing the names of 24 cities enables at-a-glance readings of the time in all the world’s time zones in relation to the time shown by the 24-hour hand (home time). The dial featuring a stamped circular raised motif displays excellent readability, enhanced by oversized luminescent hands and hour-markers and red-rimmed counters reminiscent of automobile dashboards. 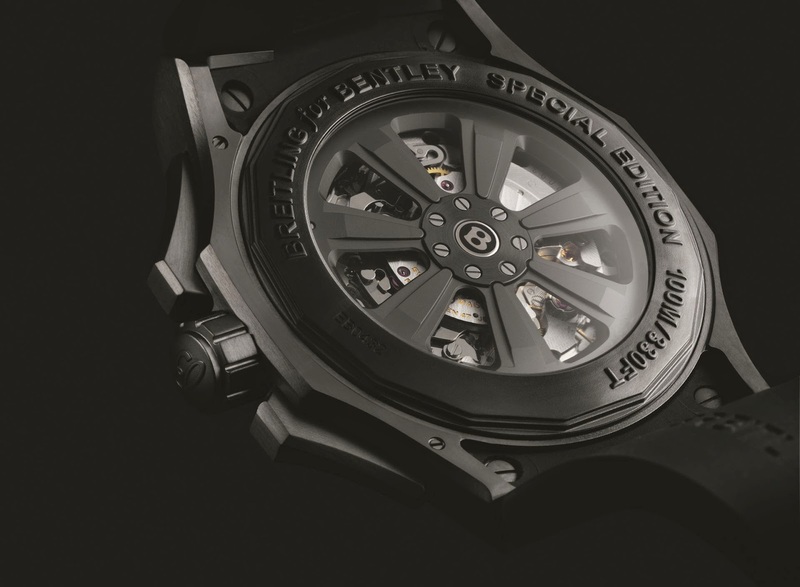 The Bentley GMT Light Body B04 Midnight Carbon model is also equipped with a transparent caseback providing a chance to admire the self-winding B04 chronograph movement, chronometer certified by the COSC (Swiss Official Chronometer Testing Institute), like all Breitling for Bentley ‘engines’.